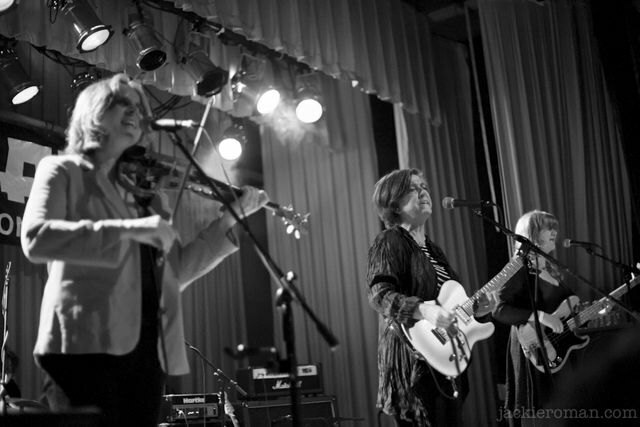 The Raincoats, a post-punk 70s fem band kicked off their North American tour at Warsaw, Greenpoint’s combination rock club-Polish National House, on Saturday. It is the first of six rare shows scheduled to promote the reissue of their sophomore album Odyshape, originally released in 1981. One-lady act No Bra and three-piece girl band Grass Widow appear earlier on this estrogen-powered bill, with all-girl DJ set Tobi Vail (Bikini Kill) & Amy Yao (Emily’s Sassy Lime) arranged to conclude the night. Anticipation is running high on the queue outside Warsaw, as the bands spend an extra hour setting up. Emma Casey, 20, is near the front of the line hoping that the doors will open soon. “There’s nothing like them,” she says about the headlining band. “Their sound is organic. The sound they make on stage is the same as the one they record in the studio.” She finds that this is a rarity among new bands. Warsaw finally opens its doors once the line reaches the end of the street. A steady stream of people slowly fills the hall. Some head for the bar while others make a beeline for the refreshments room to grab a plate of pierogies before the start of the show. Sound check begins just as the crowd starts to thicken. A lot of older fans can be seen milling around. Mark Bourdeau, a college teacher, is so delighted that he nearly hops up and down. He enjoys listening to “thinking person’s music.” This stuff is genuinely quirky, simple and ironic in a way that is not mean, he says. 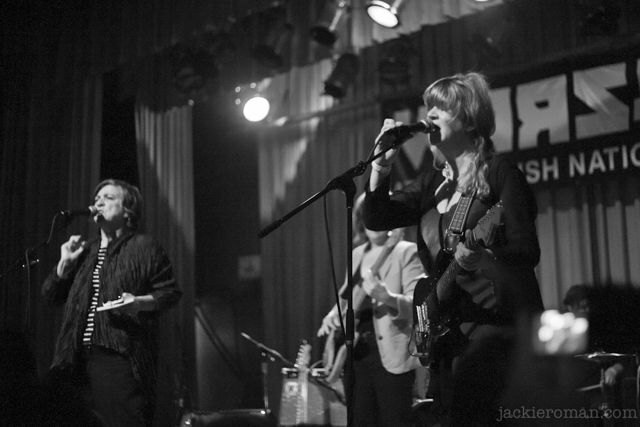 The Raincoats are a special group to Mark. “They are not a female version of anything,” he says. Other female rock icons of the same era were often compared to other men, like Joan Jett, who was sometimes credited as the female Chuck Berry. When the ladies hit the stage their energy sends the crowd into motion. A lot has changed since this band’s official start in 1977, but their enthusiasm has certainly not diminished. “More bass!” someone calls from the crowd after the first song. The Raincoats quickly oblige. They are not hesitant to interact with their fans. As Anne Woods tears into her violin as though it were a guitar, Gina Birch fans the flames in the crowd. “You ask me if I’m angry? I say, why the hell would I not be?” she cries out. Her question meets an eruption of cheers. While some of music’s more academic critics worry about equating types of music with sexuality, The Raincoats have an unmistakable female sound. 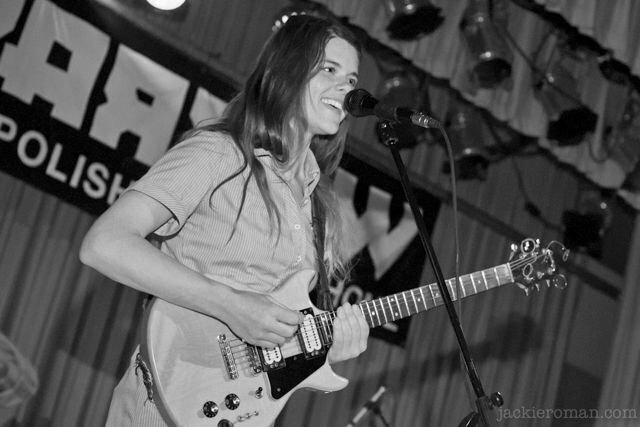 Songs like “In Love” and “No Looking,” Emma says, have ways of reassuring young female fans that other punk sounds do not. Female fans aren’t the only ones to feel rewarded tonight. As the front of the crowd works itself into a frenzy, one particularly affected young man finds his way onto the stage. The show can be considered a hit at this point.